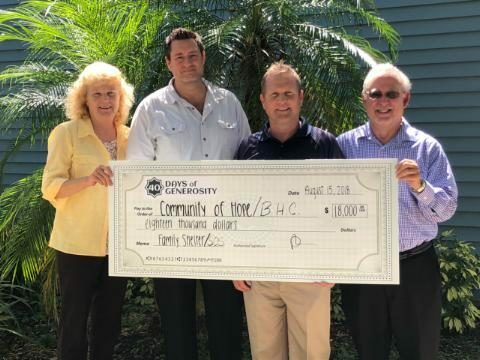 We are excited to announce that our Safe Overnight Stay (S.O.S) Program, a partnership with the Brevard Homeless Coalition, Inc, has received a wonderful donation from Hope for North Brevard, Inc as part of their 40 Days of Generosity campaign, where the City of Titusville's community came together to make a difference for their citizens. Oftentimes, families that unexpectedly become homeless- especially for the first time- aren't sure what resources are available to them or what to do next. According to a HUD study, 50-75% of first-time homeless families stay in assistive housing only once in the eighteen month period but tended to stay in shelter situations longer which cost them more money and reduces their ability to find long-term housing solutions. Additionally, they found that the families that had a social worker or other staff member assist in creating a long-term plan had significantly better outcomes than those who did now. This amazing support represents a multitude of families over the course of the next year that will be sheltered for a short period of intensive case management to help them develop a plan while maintaining familial stability which will reduces the trauma to both children and parents alike.